Piracy itself is ancient of days. The word pirate comes from the same Greek root as “peril” (which seems appropriate)—and you don’t get Greek roots like that without having been around for a long time. It seems likely that piracy in some form dates back to the beginning of transportation by water. There have been Ancient Greek, Roman, Phoenician, and Carthaginian pirates, post-Renaissance pirates, the Vikings, Chinese pirates, Russian pirates, Indonesian pirates, and of course the famously dangerous Barbary pirates—those Muslim marauders who swept out of ports across North Africa for a few hundred years, making the Barbary Coast a byword for danger. 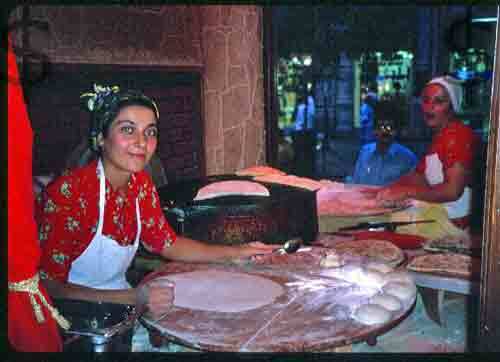 Women make traditional Turkish breads in an Istanbul restaurant. Turkey is one of those places where there seems to be almost too much history. This is where the Trojan War and the Battle of Gallipoli took place, where the Byzantine Empire rose and fell, where the apostle Paul was born, where Hittites, Bythinians, Thracians, Greeks, Romans, Turkomans, and Ottomans built cities and empires. It was once called Asia Minor, and it has long been a crossroads for the world. However, I looked forward to coming home and not having to be quite so careful. Ha! I return to discover that I now have to be careful with tomatoes here at home. Of course, I’m pleased I can go back to having lettuce and other leafy greens, but I was looking forward to my favorite fresh salsa, and now I have to be careful—and I’m not even on vacation. Well, being the information addict that I am, I looked into the “rules” in effect now that we have questionable tomatoes threatening our health. Fortunately, local farmers’ markets are safe, and the Center for Disease Control (CDC)— http://www.cdc.gov —offers a list of places that have not had Salmonella outbreaks, and from which we can safely buy our tomatoes. But what do I do with that quart of fresh salsa I just bought? Happily, Salmonella is pretty easily killed. The CDC says if I cook my fresh salsa (or raw tomatoes) at 145 degrees Fahrenheit for at least 15 seconds, it will kill the Salmonella. So this quart of Roma tomato-based salsa is going into soup.